My favorite kale is Lacinato for it’s delicate flavor and texture. If it’s available, I choose it for my salad. 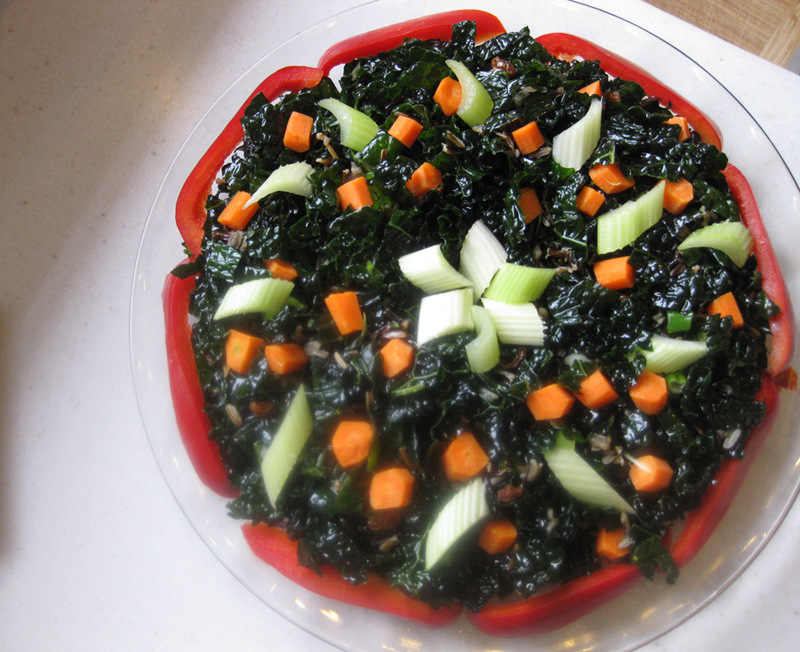 I also like all the black kales and use them as a base, sometimes adding red or green kales in smaller amounts. Store covered in refrigerator. All organic ingredients are encouraged. I cook the rice while I’m washing the kale so it’s cool by the time I prepare my salad. Rinse the wild rice in a fine strainer. Boil the water and sea salt in a medium pot and add the wild rice. Bring to a boil again and reduce heat to medium low or low. Simmer for about 45 minutes and when the mixture is almost cooked, turn off the heat and let it sit to finish cooking. Let the rice cool down on the stove for several hours or more. 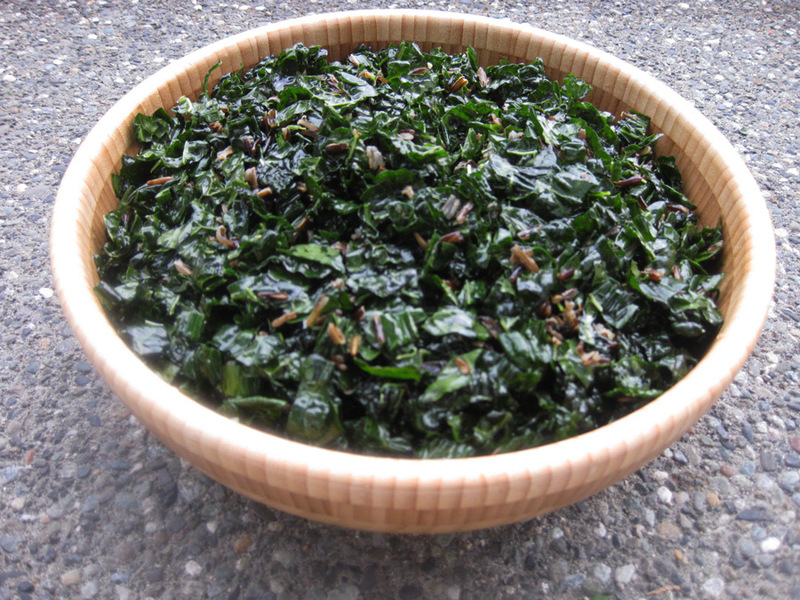 While the rice is cooking, divide the kale into 2 or 3 quantities for washing. If there are leaves of poor quality or infested, discard them at this time. 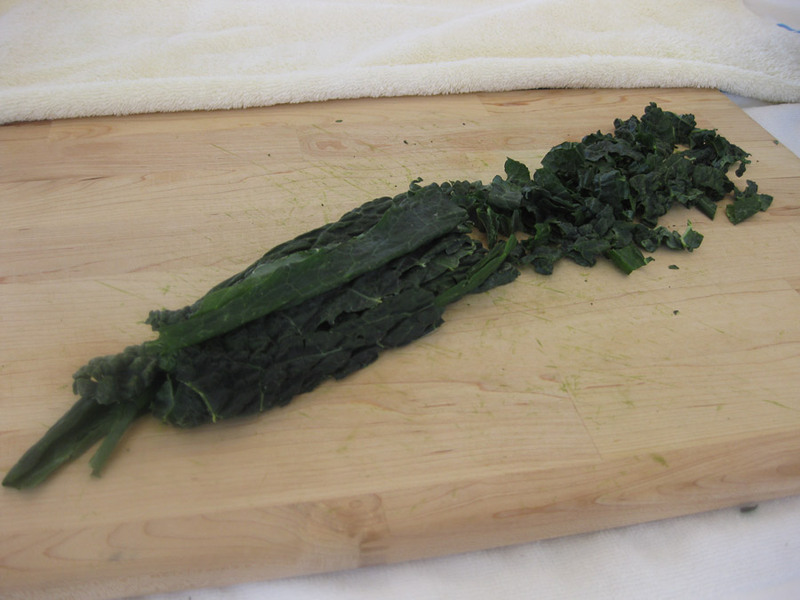 Place a quantity of kale in the sink and fill the sink with water. Swirl the kale in the water with your hands and drain. Do this two or more times until most of the dirt has been removed. Then wash each leaf directly under running water and place in a strainer or drainer while you wash the rest. Then, take a small group of leaves in your hand and gently shake them back and forth against the sides of your sink to release water. 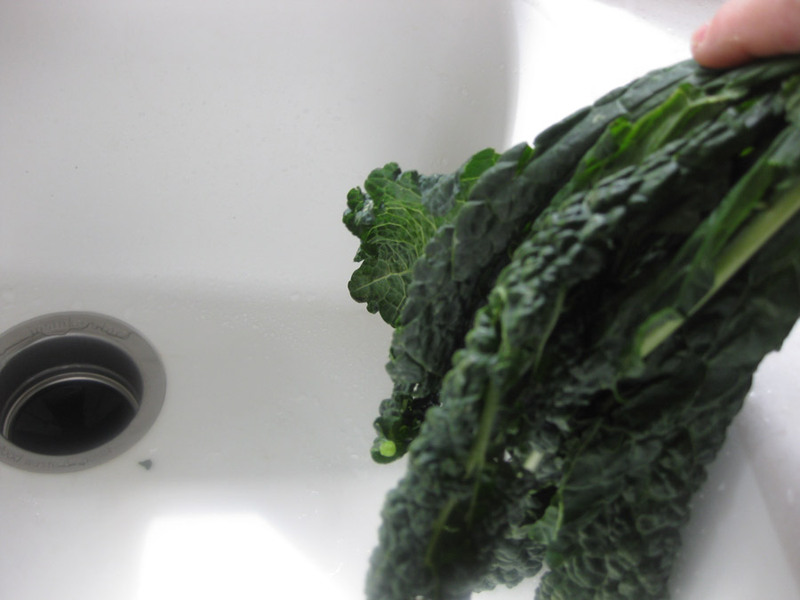 Gently shake the kale leaves back and forth against the sides of your sink to release water. By doing this, you’ll be able to air dry the kale. 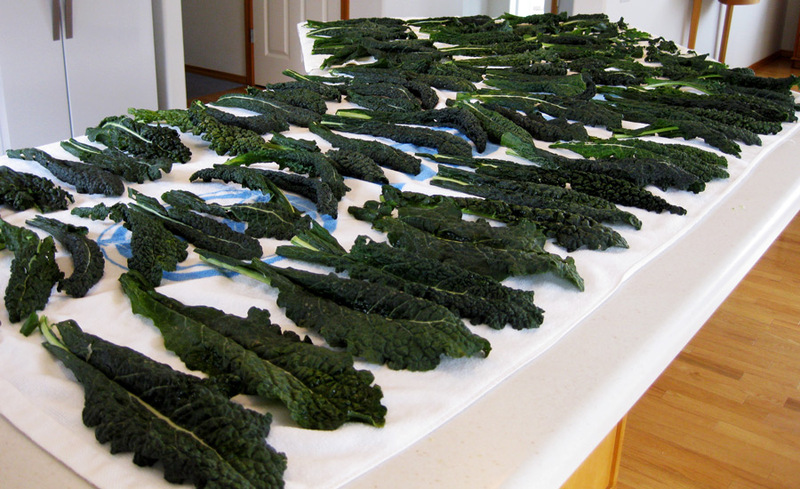 Just lay each kale leaf out on towels and let them dry for about 2 hours. That’s a lot of kale! Remove the stems/veins from the kale by cutting or by hand. Over time I found it easier and faster to use my hands to pull the kale from the stems. I cut the large leaves lengthwise if needed. Then, I pile the kale as high as possible to save time as I cut it into pieces. If some of the kale is still wet, you can cut it anyway. It will finish drying in the large bowl of cut kale. In a small bowl, mix together the lemon juice, olive oil and tamari. 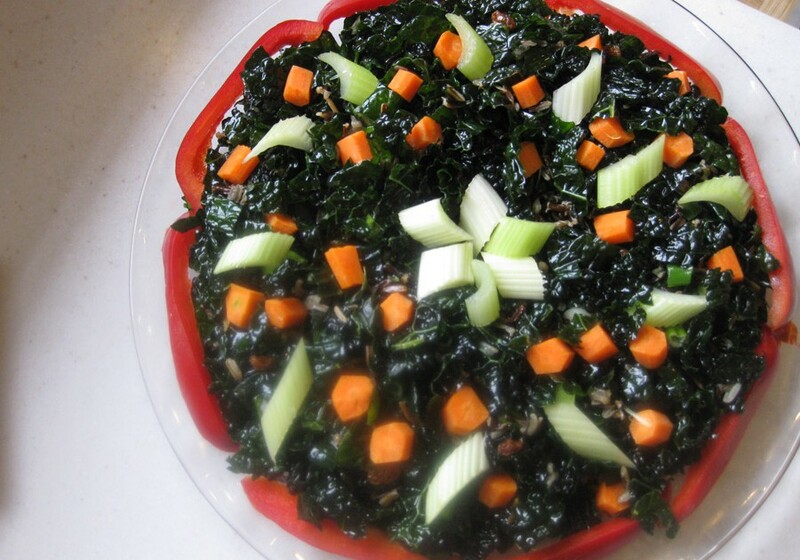 Add this salad dressing mixture, wild rice and raisins to the bowl of cut kale and mix it by hand or with utensils. Massage the kale vigorously by hand if you want to eat it that day. The same process will occur without massaging if you refrigerate your bowl overnight (covered), as I like to do. 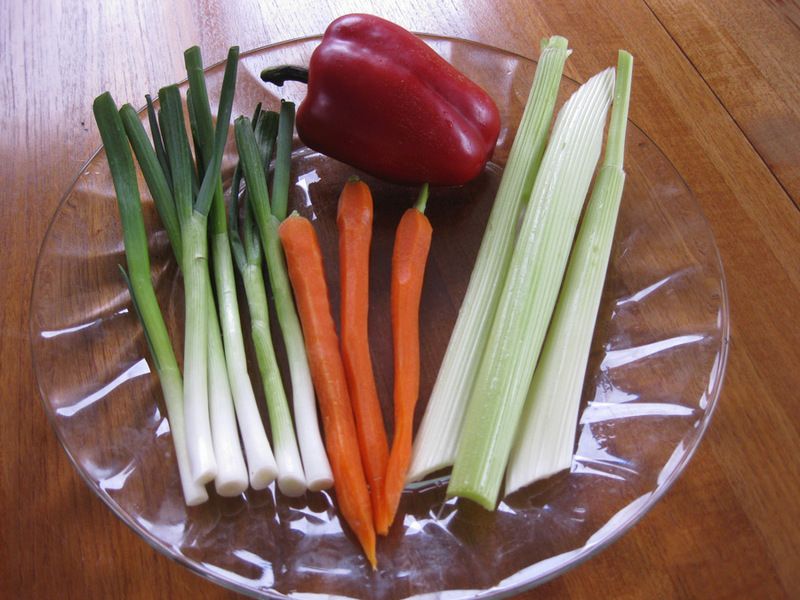 The salad is ready to eat as is or with added olive oil, coconut oil, vinegar or other dressings you might choose. We often add raw items such as avocado, raw nuts and seeds, etc. When it comes to cooked items, we often add hummus, cheeses or roasted nuts or seeds. This salad is delicious with salmon, eggs and many dishes you may choose. 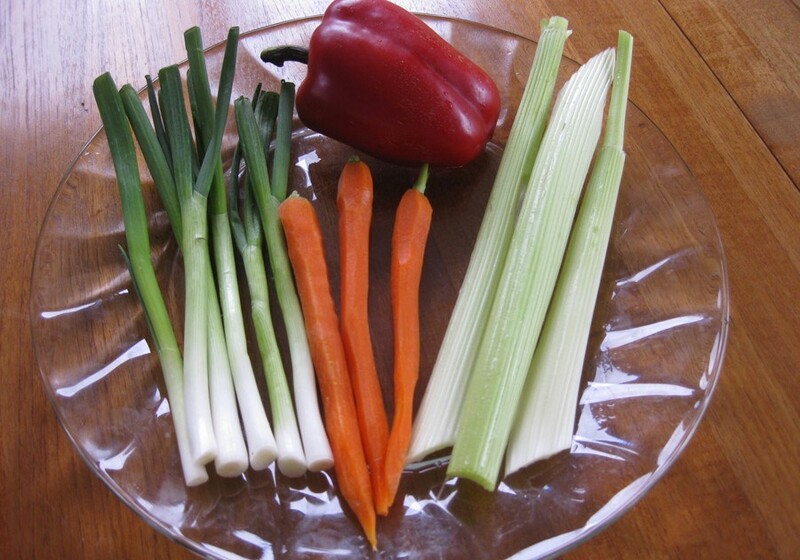 To emphasize the raw, think of the salad as the main dish and whatever you serve it with as the side dish.